The exterior of our vehicle is important to maintain, and we don’t mean just for the shine! Keeping the paint on a car clean, polished, and waxed upholds the car’s resale value, and when it comes to Audi vehicles, it’s tough to beat the value retention. 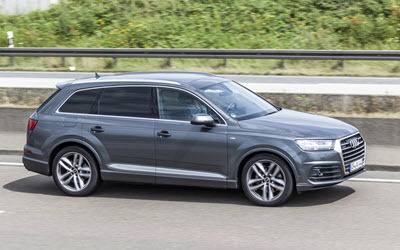 The Audi Q7 is especially known for its elegance, inside and out. However, such Audi owners rarely consider the interior of the car to be just as important as the outside paint job. The truth of the matter is, the interior matters just as much as the exterior, and it’s important to integrate it into your care regimen. We know that finding time to squeeze one more appointment into your daily list of activities is difficult, but you’ll thank us for this one. Establishing a maintenance routine for your Audi’s interior is essential if you have any hope of continuing ongoing care. Routine interior cleanings and treatments can help keep your Audi’s interior looking brand new well into its aging process. This is perhaps one of the most important aspects of protecting your interior from damage and wear. When an Audi Q7 with its leather interior sits in the sun, the moisture in the leather dries out, leaving the material especially susceptible to sun damage and regular wear from clothing, or harmful materials. Window tinting can help, but it’s best to store your Audi in a covered area like a garage or carport as often as possible. Long drives without a meal can be excruciating, and it’s awfully tempting to pull over for a quick bite in the car while driving. Let us caution you: avoid temptation! The interior of your Audi Q7 can be easily damaged or stained by sticky, sugary drinks, dark liquids like coffee, greasy foods, and, of course, anything that melts. If your 10-year-old niece loves to enjoy a piece of gum in the back seat, maybe it’s time for a change of rules. Lastly, smoking in the car can stain the interior, and it’s incredibly difficult and sometimes impossible to remove the smell of smoke from the cabin. You’re the expert on your own car, and only you can prevent circumstances that lead to interior damage; therefore, it’s important to consistently be vigilant of any scratches, tears, or worn spots in your Audi’s interior. The sooner you catch a problem, the more likely it is to be affordable and fixable. Audi’s are luxury vehicles, which is why you might not feel exactly right throwing a pair of muddy boots on the back seat and driving off to the beach. It’s also not realistic to avoid these wonderful, messy occasions in life because we don’t want to get our car dirty. All it takes is a little careful planning beforehand, and your interior will be unaffected. Keeping towels, sheets, paper towels, or plastic sheets in the trunk is a good way to stay prepared for life’s moments on-the-fly. At Foreign Automotive, we treat every client’s vehicle as if it were our own. With a passion for Audi vehicles in particular, we serve a wide range of clients and models, including the Audi Q7 for residents of Kitchener, Waterloo, and Cambridge, ON. Since 1992 we’ve kept the same mission statement, which includes our commitment to: providing affordable rates, using quality parts, guaranteeing our work, which means upholding accuracy, honesty, and integrity. If you’d like more tips on how to care for the interior of your Audi Q7, please call our shop today—we’d be happy to help. * Audi Q7 on Road image credit goes to: typhoonski. * Audi Interior image credit goes to: ManuelGonzalezOlaecheaFranco.